You may see more posts like this on my blog over the next couple of months, I have far to much time on my hands and far too much of an obsession with finding (and buying) bargains! I won't be posting these daily, but maybe a couple of times a week. Let me know if you'd like me to try to find any trends / items / themes in particular for bargain prices. Anyhow, onto today's finds! There are so many bargains to be found on Daisystreet, but I've shared just two of my current favourites with you for now. They offer free delivery on everything by the way! 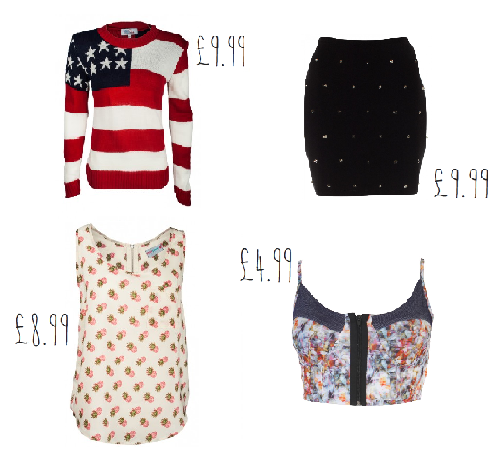 The pineapple top has been reduced to £8.99 - I think it's really cute! Perfect for summer (let's pretend the weather is better than it is right now...!). Next up, a jumper. It looks so cosy and perfect for the actual weather at the moment! I love layering so I can imagine this looking great oversized. It's £9.99 - I can't believe that! I also came across this bralet. I don't think you'll ever catch me in one a) because I can't see them fitting me right and b) because I'm not confident enough... but this is £4.99, so I couldn't not share it with you all! You do have to pay for delivery from this website, but there are a ton of bargains to be found on that website, you just might have to sift through the less 'nice' bits! Finally, I absolutely love this Internacionale skirt, it's £9.99. I'm a sucker for studded clothing / shoes / anything! I think it would look brilliant for a night out, or dressed down with some tights and boots. They're currently offering £1 delivery and 20% off if you sign up to their newsletter. I actually managed to just order it as I've been writing this paragraph... oops!